• The United Kingdom’s vote to leave the European Union on Friday triggered global market turbulence. • On Friday, Japanese equities as represented by the benchmark Nikkei 225 Index fell by 8%, the largest 1-day fall in 32 months. The 10-day volatility of the Nikkei 225 Index spiked to 52% on Friday, just behind the Eurostoxx 50 Index. • The Japanese yen strengthened 4% while all other Asian currencies depreciated. • The local Japanese market halted trading for 10 minutes during the day, during which the SGX Nikkei Futures was the primary platform for continuous price discovery. On Friday, the United Kingdom (UK) voted to leave the European Union (EU), triggering volatility across global financial markets. “Brexit” took traders by surprise and caused an historic depreciation of the pound sterling, while boosting safe-haven currencies such as the US dollar and Japanese Yen. The US dollar and Japanese yen rallied versus the pound by a record 9% and 11% respectively. Versus the US dollar, the yen strengthened 3.7% on Friday, while all other Asian currencies depreciated. All Asian markets fell on Friday, though Japan was the most impacted. The benchmark Nikkei 225 Index fell 7.9%, its largest 1-day fall since March 2011 when the Japan market was shocked by the Fukushima nuclear accident. Downward pressure on Japanese equities was amplified by the strong yen, which will negatively impact profits at export-oriented firms. SGX front month futures on the Nikkei 225 Index fell sharply to 8.6% on Friday, before paring losses to 6.4% to close the day session at 14,790 index points. On Monday, 26 June, the SGX Nikkei futures front month contract rebounded by 1.3% on hopes of intervention to weaken the yen. The SGX Nikkei futures was the primary platform for continued price discovery during a trading halt on the local Japanese market from 11.48 am to 11.58 am Singapore time on Friday. During this period, SGX Nikkei futures market allowed investors to express their price views and effectively manage their risk. The SGX Nikkei futures gradually recovered 1.8% from 14,845 index points to 15,105 index points, with the SGX futures being the primary market for associated futures pricing. The role that SGX Nikkei futures played in providing a fair and orderly price discovery process for the Nikkei 225 Index is illustrated by the blue line in the chart below. As the impact of Brexit vote continues to be felt across global capital markets, the focus has shifted to central banks as they seek to minimise the damage. Japan has emerged as the main casualty of the Brexit aftermath, as the nation’s economy faces severe downside risks in the strengthening yen and the stock market that has lost 19.6% since the beginning of the year.</p> <p>The rising strength of the yen prompted the Japanese government to hold an emergency meeting on Monday, where Prime Minister Shinzo Abe reportedly instructed Finance Ministry and the Bank of Japan (BOJ) to watch currency markets “ever more closely” and if necessary to take measures to stabilise the market. Analysts expect the BOJ to intervene in currency markets anytime to contain the fallout, while the likelihood of BOJ expanding its quantitative easing programmes has increased.</p> <p>In the US, markets are pricing in a slim chance that the Federal Reserve will cut interest rates in its next meeting on 27 July, which prior to Brexit was deemed highly unlikely. Traders have priced out any chance of a Federal Reserve rate hike this year. 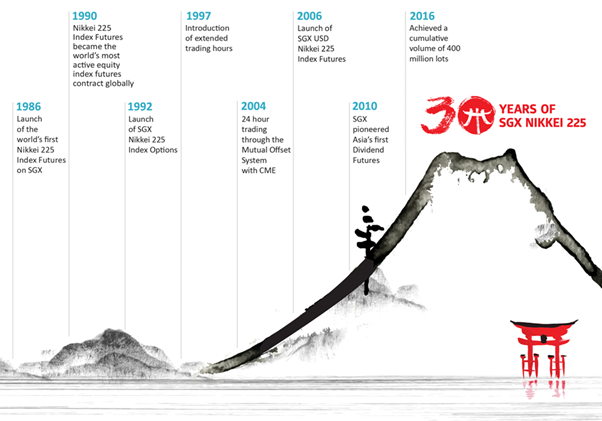 This year marks 30 years since SGX pioneered the world’s first futures contract based on the Japanese stock market – the SGX Nikkei 225 Index Futures. The SGX Nikkei 225 Index Futures internationalised the Japan equity futures market and is actively traded by participants all over the globe. Leveraging on the contracts success, SGX has launched complementary products including options on the Nikkei 225 Index as well as Asia’s first dividend index futures. In the last decade, SGX Nikkei trading has successfully transitioned from floor to electronic trading and turnover has grown to 4.5X of the previous 10 years. We thank you for your support and look forward to further decades of success!